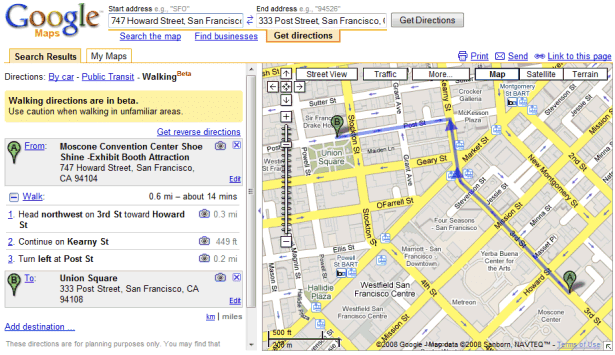 As anticipated two weeks ago, Google Maps added walking directions. "Starting today, you can tell Google Maps that you want walking directions, and we'll try to find you a route that's direct, flat, and uses pedestrian pathways when we know about them. Just get directions as you normally would. If you're going 10 km or less (some call this 6.2 miles), we'll show you a link that you can click to get Walking directions," informs Google LatLong blog. The feature is still in beta because Google has incomplete data about pedestrian pathways. Google Maps advises you to "use caution when walking in unfamiliar areas". Tip. If you only see driving directions, copy the permalink of the page by clicking on "Link to this page", append &dirflg=w and paste the new URL in the address bar. As usually with Google Maps directions, you can print them, email them, obtain a permalink that can be bookmarked or embed them in a site. Another option is to save the directions as a custom map: just click on "Link to this page", copy the link, add &output=kml at the end and then create a new map in the My Maps tab by importing the KML file. Until recently, Ask.com offered walking directions, but the feature is no longer available because Ask.com decided to replace its mapping service with Microsoft Virtual Earth. thanks uncle google.. thats a REALLY nice feature. I'll 'use caution' alright! Google maps is quite happy to tell people in Australia to drive on the American side of multi-lane roads, and owing to the large number of stupid people out there, it's only a matter of time until someone does "because the computer said so"
how does google maps tell you what side of the road to drive on? Sounds like a good idea. However, I think the current implementation may need a bit of refinement. I have just had a look at the directions from my house into town. Driving directions: 5.0 km. Walking directions: 5.2 km. I wonder why Google suggests I walk an extra 0.2 km. It is perfectly possible to walk the driving route, and the walking route is not obviously quieter or more scenic. The walking directions on my sample route near my town are just as good for a use with a car as walking. Google appears not to realise that when walking you can cut across public parks! It also happens to direct you yhe wrong way along a one-way street with driving directions, making them better for walking and the walking instructions don't, so they are actually better for driving! Just looking at the public transport option: it's done better than the dedicated local public transport sites do! walking directions LA to NYC ! What do you wanna bet MS paid Ask for the inclusion? I find the warning to watch unfamiliar areas funny because chances are if you're using Google Maps to find your way around, you're not familiar with the area. Much needed service. Though it might not be 100% accurate as it assumes pedestrian always using pathways but it surely is better than getting driving routes which has one-ways all into it. Now can we PLEASE get biking directions?!?!? !